【Professional App Racing Game Kit】 - After receiving your item, please scan the QR code on the manufacturer package(or to Google Play and Apple Store to search for XVR GO) to download the free game App. This 3D VR Headset&Racing Steering Wheel doesn't not include 3 AA batteries, please prepare 3 AA Alkaline before using. Please read the instructions carefully for more detail. 【Ergonomic Design VR Headset】 - Adjustable T-shaped strap is lightweight material, which can decrease the pressure on the eyes and head to provide more comfortable feelings. Moreover, the nose area is deepened to reduce the pressure. Professional racing steering wheel and VR Glasses create a more HD visual experience and racing pleasure for you. 【Real Racing Game Experience Set】 - 3D VR Glasses create the real 360 ° panoramic scene roaming experience, you can see the situations in all directions. Steering wheel (Not included 4 AA Alkaline) can provide vibration feedback function. With our Bluetooth steering wheel, you can drive, accelerate, and brake to reach ultimate control finally. 【100% Quality Guarantee】 - The Racing Gamie Set can not work with TV. 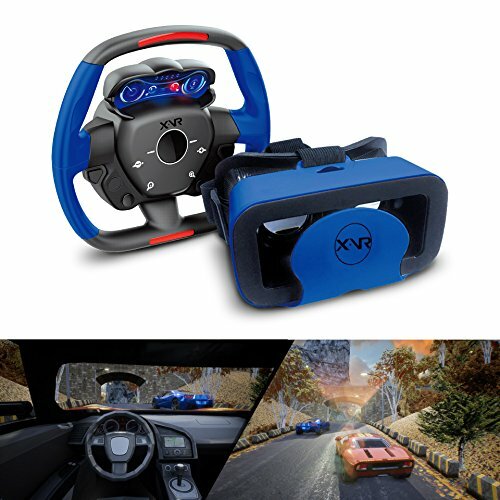 All customers buy Resulzon XVR Racing Game set in our store, if there is any quality problem or any suggestion, please feel free to contact us! Our Customer Service Team will reply you within 24 hours, we make sure you are 100% satisfied and pleasant with shopping experience! We take pride in getting things right! If you have any questions about this product by Resulzon, contact us by completing and submitting the form below. If you are looking for a specif part number, please include it with your message.